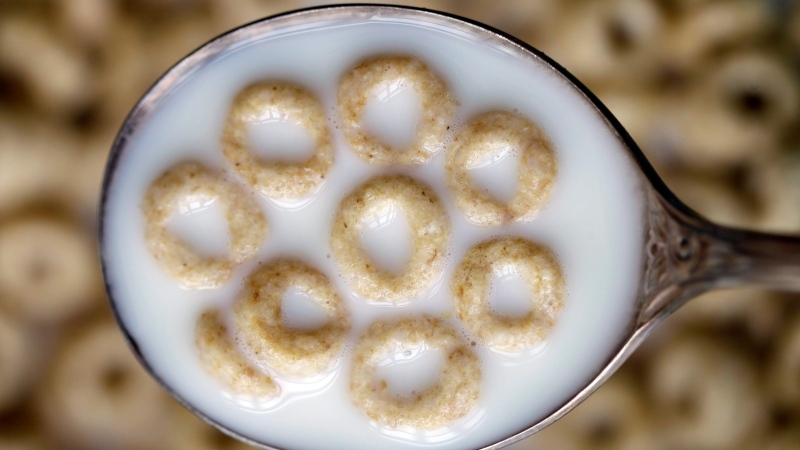 From Cheerios to Oreos to chocolate glazed Timbits, a controversial weed-killing chemical has been found in several popular food products in Canada. In a study commissioned by advocacy group Environmental Defence Canada and independently conducted by California-based Anresco Laboratories, 18 common food items were tested for glyphosate, the active ingredient of a chemical herbicide sold under the name Roundup and found in many agricultural and gardening products. Although the issue remains hotly contested, several studies and court cases have linked the widely-used chemical to cancer. Muhannad Malas, Toxics Program Manager at Environmental Defence, said the findings suggest that some consumers may be unknowingly ingesting trace amounts of the disputed herbicide multiple times a day. In August, a California jury ruled that the herbicide was directly responsible for causing a man’s terminal cancer. But numerous reports, including one from Health Canada last year, found that the product poses no health risks. Glyphosate is registered for use in more than 160 countries, making it the most widely-used weed killer in the world. Because it is sprayed on a variety of crops -- from corn to soybeans to wheat -- the chemical can end up in the harvested material that is used in food processing. Companies with products named in the Environmental Defence Canada report told CTV News that they followed Health Canada guidelines and that their products are safe. Bayer, which bought Roundup maker Monsanto in June, also insists that the chemical poses absolutely no harm. The scientific community is also torn over whether or not ingesting glyphosate is harmful. Health Canada’s most recent study of glyphosate, in 2017, found that the herbicide in low levels was “unlikely to pose a human cancer risk” and allowed it to be used for another 15 years. That conclusion still stands, according to the Canadian Food Inspection Agency. “To date, none of the levels of glyphosate found in products through the CFIA surveys have been deemed to be a health risk by Health Canada and no recalls were warranted,” said spokesperson Karelle Beaudoin in a statement. Similar findings have been released by the European Food Safety Authority, the European Chemicals Agency, the U.S. Environmental Protection Agency and the Australian Pesticides and Veterinary Medicines Authority. “They’re not the kinds of levels with which we would be concerned toxicologically. So what would people get from this? I think nothing at all, quite frankly,” Ritter said. Other animal-based studies suggest that the chemical can lead to reproductive issues among mammals and is harmful to bees, fish and rats. “I see very strong correlations between the rise in a long list of debilitating autoimmune, neurological and oncological diseases exactly in step with the rise in use of glyphosate on core crops,” Seneff said. In August, moreover, a San Francisco jury ordered Monsanto to pay US$289 million to a former school groundskeeper, saying that Roundup contributed to his terminal cancer. Shares of Bayer, which acquired Monsanto in June, plunged 11 per cent immediately following the verdict. Bayer confirmed it was facing more than 8,700 similar lawsuits as of Aug. 27. “I hope it gets the attention that it needs," Johnson said following the decision. Previous studies have found traces of the chemical in human urine, breast milk, beer and several common foods. Farmers around the world commonly use glyphosate to kill weeds and control pests. But the U.S.-based Environmental Working Group says American farmers are increasingly spraying the chemical on oats and some other crops to help dry out the plants and harvest them sooner. Grain producers say the herbicide is widely used and effective. Cam Dahl, president of Cereals Canada, said it’s important to consider the small amount of herbicide found in the 18 products. “If people want to know what a part per billion is, you would have to eat about 36,000 full loaves of bread in a single day to get to the allowable daily limit of glyphosate. So these are very, very small, small numbers,” Dahl said. Industry group Food & Consumer Products of Canada (FCPC) also weighed in on the report, calling the glyphosate levels “significantly below” the government’s safety requirements. “FCPC recognises that glyphosate presence in foods may be of concern to Canadians. We are in regular consultation with regulatory authorities, academics, and our members to ensure the continued safety of our food,” said spokesperson Michelle Kurtz in a statement. Companies with products tested by Environmental Defence Canada, as well as Bayer Canada, responded to questions from CTV News about the presence of glyphosate. “We proudly stand by the safety and quality of our Fontaine Santé products. Preparing healthy products is Fontaine Santé’s number one priority, and we’ve been doing that for 28+ years. Fontaine Santé makes all natural products using wholesome ingredients and does not add any glyphosate during the preparation of its products. Glyphosate, is a herbicide that is approved by regulatory agencies and is commonly used by farmers across the industry who apply it pre-harvest. “Environmental Defence Canada is a social action environmental group that has as one of its mandates opposing the use of chemicals in everyday products, including products like glyphosate. Glyphosate is a widely-used and effective herbicide with a 40-year history of safe use. Canada’s health authorities have extensively reviewed glyphosate and approved it for use according to label instructions. For chickpea based foods, the highest reported value was 760 parts per billion in hummus. At this level, an adult would have to eat 28 kg of hummus every day for life to reach PMRA’s allowable exposure limit. That’s over a kilogram of hummus every hour of every day for life without sleeping. For wheat-based foods (744 parts per billion in tortillas), an adult would have to eat 28 kg of tortillas every day for the life to reach PMRA’s allowable exposure limit. That’s 430 tortillas per day. Every day. Regulatory authorities have strict rules when it comes to pesticide residues. Health Canada’s Pest Management Regulatory Agency (PMRA) and the U.S. Environmental Protection Agency (EPA), for example, set daily exposure limits at least 100 times below levels show to have no negative effect in safety studies. Health Canada has clearly stated there is no risk from eating conventionally-grown foods because of pesticide residues. Perpetuating myths or a cause for celebration? I mean, technically, he is. Nova Scotia will soon become the first jurisdiction to pass the legislation in North America.